I have never had a wishlist of things so beautiful﻿. Honestly, I really don't. I've been wishlisting the world for a couple of years on here now and if I could have all of one wishlist, I would say, "can I have that one?" First of all, the new collection of converse are to die for with their neutral pink tones and extremely girly look which I totally love. The newest Tarte palette is top on my makeup wishlist thanks to those gorgeous warm red tones I've always adored. That cardigan is everything I dream a cardigan to be, simple, cosy, versatile but still fun. And I really, really want to try the new Zoella diffusers! Especially lazy days, because I've never had a diffuser and you don't have to burn them. On the second row, I've got the parka I've fallen for. I've been looking out for a potential new coat and after giving up found this one on the Miss Selfridge website. It's got fur on the inside. I've been staring at The Body Shop's Himalayan Charcoal Face Mask when I've gone past any of their stores, so much so that I'm getting a little sad that I don't have it. And I fell for these gorgeous embroidered boots after window shopping the embroidered trend which is just amazing. Last but not least, I have a huge love for sweaters at the moment and it seems to be the only thing I wear at home. This one would be perfect for at home, or out too. It's cute, pink and girly just the way I like it. I just had to say why I wanted all of these. 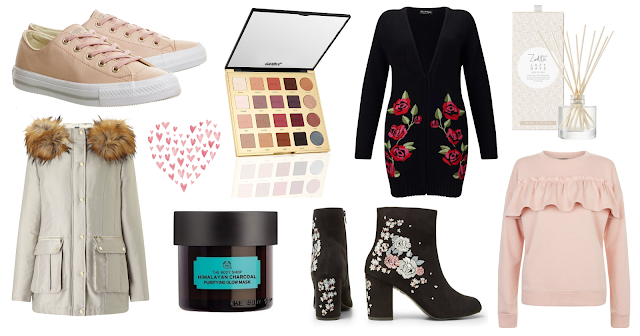 What do you like from my wishlist picks this week? The boots! I need embroidered boots in my life so much!! Okay those boots are just amazing! I really want to try out some of the zoella range! It all looks so good!